If you're pinching pennies, or maybe just nerdy about your fuel consumption, perhaps you've noted that your fuel efficiency gets a fair bit worse during the winter. For example, my classic Oldsmobile averages about 16.0 mpg (14.7 L/100 km) in the summer and only about 12.2 mpg (19.3 L/100 km) in the winter. There are many factors affecting your fuel economy, like the rolling resistance of the tires and the car's aerodynamic drag. Winter conditions (mostly just the cold temperatures) tend to negatively impact several of these influencing factors, as outlined below. Aerodynamic drag is the resisting force that air applies on a moving object like a ball, car, or aircraft. Basically, the object crashes into the air molecules in front of it. The air has to be pushed out of the way and the drag force comes from that air pushing back against the object. Large, bluntly shaped objects with rough surfaces experience a lot more drag than smaller objects with smooth surfaces shaped to gently push through the air. And large drag forces mean more energy is needed to overcome them. Think of the difference between slicing through cheese with a brick versus a knife. where FD is the drag force, ρ is the air density, v is the velocity, CD is a dimensionless drag coefficient, and A is the frontal area. So what's the effect of winter on drag force? Sure, it could be argued that your car has a bit more area if it's got a layer of snow and ice on it. Similarly, the snow and ice make your car's surfaces rougher, so it could be argued that the drag coefficient increases as well. But those are negligible effects and don't explain the loss of fuel economy when it's cold but your car is clean. The real culprit here is air density. Cold air is denser than warm air, so the drag force is simply higher during winter. At -10 °C, the drag force is about 12% larger than at +20 °C. Here's a figure showing the density of air versus its temperature, assuming 50% humidity and 200 m elevation above sea level. The magnitude of the density will decrease at higher humidity and/or elevation, but the trend as a function of temperature is essentially unchanged. Cold air is denser than warm air and the aerodynamic drag force is proportional to the air density. Your tires aren't perfectly circular: they form a flat area where they contact the road. Deformed shape of a tire on a rigid surface during static (constant speed), acceleration, and braking conditions. As the wheel turns, the tire is continuously being flattened out at the contact point (and returning to circular coming off the contact point). The rubber in tires exhibits an interesting material property known as hysteresis. Hysteresis is when the material behaves differently depending on whether it is being loaded or unloaded. Stress-strain relation of a material with hysteresis. The path from A to B depends on whether the stress is increasing or decreasing. The shaded area between the two paths represents the energy lost due to hysteresis. It takes some input of mechanical energy to cause the tire to go from the natural shape to the deformed shape. If rubber had no hysteresis, all of the mechanical energy would be returned during the reverse process, going from the deformed shape to the natural shape of the tire. But what we really see is that more energy is input during loading than is output during unloading. This loss of energy translates to lost fuel economy because some of the work done by the engine has to feed the energy consumption of the tires. Most of the rolling resistance from your wheels is from this energy absorbing behaviour of the material. If you're wondering where the extra energy disappears to, the answer is heat. As the rubber keeps absorbing energy, receiving more mechanical energy than it gives back, it starts to heat up. This is why your tires are warm after a long drive. Of course, the temperature of your tires cannot increase indefinitely because eventually a steady-state heat transfer rate is achieved. The rate at which heat dissipates to the air increases with both increasing tire temperature and car velocity. Okay, so how do winter conditions affect hysteresis? Well, the effect is more pronounced when the rubber is cold. So in the winter, tire rolling resistance is higher, especially if you're only taking short trips (remember that your tires begin to heat up as you drive). There's roughly 1% increase in rolling resistance for every 1 °C drop in temperature. But there's another cause. The hysteresis effect also increases as your tire pressure decreases. 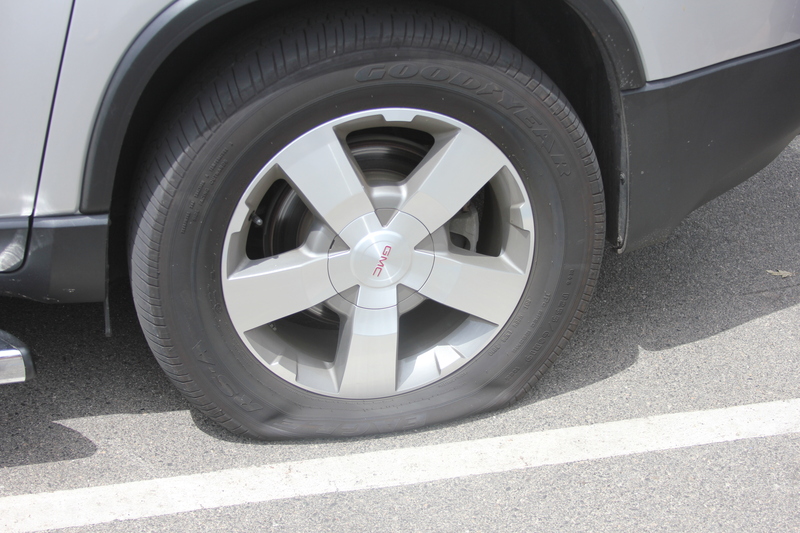 If your tire pressure is low, more deformation occurs in the tire as it rolls. And when the temperature of a gas decreases at a constant volume, the gas pressure has to drop in the same proportion (see Amontons' Law). That means your tire pressure drops when it's cold. Based on typical operating pressure and typical rolling resistance curves for tires on hard surfaces, rolling resistance increases by roughly 4% for every 1 psi drop in pressure below the recommended operating pressure. A typical car tire will experience approximately 1.5 psi drop in pressure for every 10 °C drop in temperature. So a 30 °C drop in temperature might increase your rolling resistance by about 50% if you don't remember to keep your tire pressure at optimum! If your tire looks like this, fuel efficiency maybe isn't your top concern. However, you can easily counter the effect of temperature on your tire pressure by simply adding a bit of air in the winter. A related source of rolling resistance comes from the road itself. The road surface deforms slightly under the pressure from the wheels of your car. Because of that deformation, your wheels are actually always moving out of a small depression as you drive, and so the road is a source of rolling resistance. The contact surface for a rigid wheel on a deformable road. Hard, stiff road surfaces like concrete don't offer as much resistance as say gravel or your neighbour's lawn, but there's still some resistance there. Snow and slush on the roads increases rolling resistance to some extent, contributing to further reductions in winter fuel economy. Aerodynamic drag also contributes to rolling resistance because a layer of air close to the tire has to be dragged around the wheel as it turns. As described in the previous section, drag increases because air density increases as temperature decreases. Therefore, the rolling resistance contributed by aerodynamic drag also increases as the temperature drops in the winter. Finally, slippage contributes to the total energy losses from rolling. Even on clean, dry roads, your tires experience a bit of slippage as you drive. The applied torque required at the drive wheels to maintain a certain speed increases as slippage increases, wasting energy. Obviously slippage gets worse in winter conditions when roads are wet, snowy, or icy. All of those extra moments where you're spinning the wheels without going anywhere start to add up to a bit of lost fuel economy. Or maybe a lot of lost fuel economy. To summarize this section, rolling resistance comes from three main sources: hysteresis, aerodynamic drag, and slippage. Winter conditions tend to increase losses from all three of these sources. People idle their cars more in the winter. When it's really cold, people often start their cars and let them run for several minutes to allow the interior to heat up. They also are less likely to shut the car off if they have to wait somewhere briefly (for example, when picking the kids up from school) because they don't want to get cold waiting in the car. For all that extra time your car is idling you're getting 0 miles per gallon. All of the oils and greases keeping your car's various moving parts moving smoothly become more viscous as the temperature drops. Engine oil, transmission fluid, differential fluid (if you've got a rear-wheel or all-wheel drive vehicle), etc. The more viscous the fluid is, the higher the fluid shear resistance. Which is really just a fancy way of saying it gets harder move things through the fluid. So when the automotive fluids are cold, your engine has to work harder to get all the parts moving, and that means more fuel consumption. You can partially counter the effect by switching to synthetic engine oil, or using a lower viscosity oil in winter (switching to 5W-30 instead of 10W-30 for example, as long as it's still okay for your engine). A typical grade recommendation chart. Make sure you consult the grade recommendation chart or table for your particular vehicle before switching oils. Check your owner's manual or look it up online. Your car's cabin heater and blower fan require electricity to run. Ultimately, that electricity is produced by burning gasoline. So keeping your car all toasty warm on a cold day takes extra energy, and extra fuel. And that's not the only extra load. You've got the rear defroster, the windshield wipers, and the washer fluid pump too. Perhaps you've got some other fancy doodads, like heated mirrors, heated seats, and heated steering wheel. All the extra stuff you use exclusively (or at least more often) in the winter contributes to your reduced fuel economy. Your engine doesn't run very efficiently when it's cold. And the colder it is outside, the longer it takes for your engine to warm up. This doesn't mean you should let your car idle for 5-10 minutes before you head to work in the winter. Idling wastes more fuel than your cold engine does. Even on really cold days, your engine will be sufficiently warm after just 2 minutes of idling. It is recommended that you only idle for 30 seconds and then drive gently for the next 2 minutes in order to warm up the engine. Driving will warm the engine faster than idling. But even if you're not idling excessively, the cold starting temperature means your average fuel efficiency for a given trip will be lower in the winter. The effect is more pronounced for short trips because the engine is cold for a larger proportion of the total trip. You can counter this problem by parking in a garage or using an engine block heater. Research performed in Canada has shown that for short, simulated trips in an urban setting, using an engine block heater improved fuel efficiency (relative to not using one) by up to 10% at -20 °C and 25% at -25 °C. When road conditions start to get slippery due to snow and ice, your available traction for stopping and cornering is reduced. Most drivers are at least competent enough to be cognizant of how ice will adversely affect their safety. Hence, they will slow down to compensate for the reduced traction. A car's optimal speed varies from model to model due to many different factors. However, broadly speaking, a car's fuel efficiency is at or reasonably close to optimum when driven at a steady speed within the range of 50 to 90 km/hr (31 to 56 mph) . As you start to deviate from that range, fuel efficiency typically drops off rapidly. So when the snow flies and you're driving only 35 km/hr because you don't much care for car accidents, your fuel efficiency takes a hit. For reasons partly related to safety and partly related to engine operation, gasoline manufacturers sell a different blend of chemicals as gasoline in the winter than in the summer. Gasoline has to be readily vaporized in order to power the engine, but vapor trapped in the fuel delivery system can cause stalling and difficulty starting (known as vapor lock). Accordingly, manufacturers manipulate the gasoline's Reid Vapor Pressure (RVP, a measure of volatility) by changing certain additives, making it more volatile in the winter so that your car will still run in the winter. Common winter additives are ethanol and butane. While this improves the volatility of the fuel, it also decreases the ethalpy of combustion of the fuel because both butane and ethanol have lower energy content than octane (the main ingredient in gasoline). The overall effect of the winter fuel additives is approximately 1 to 3% reduction in fuel economy. Cold temperatures increase aerodynamic drag on the car. Cold temperatures increase hysteresis losses in tires, increasing rolling resistance. Cold temperatures reduce tire pressure, increasing rolling resistance. Cold temperatures increase aerodynamic drag on the tires, increasing rolling resistance. Slush, snow, and ice increase tire slippage. Drivers typically idle longer when it's cold. Automotive fluids are more viscous at cold temperatures, effectively increasing the net friction force to be overcome by the engine. Drivers typically run heaters and defrosters in the winter, increasing electrical loads; hence, fuel consumption. Cold engines are less efficient than warm engines. For safety reasons, drivers typically slow down to speeds well below optimum when road conditions are poor. Winter grade fuel contains additives that increase volatility but reduce energy content of the fuel. Use winter tires in the winter. Maintain the manufacturer's recommended tire pressure. Don't spin your wheels even faster when you want the car to go but you have poor traction. Keep idling to an absolute minimum. Use manufacturer approved synthetic or lower viscosity lubricants in the winter. Minimize the use of your heaters and defrosters. Particularly if you don't have any passengers, it's generally more economical to just use a seat warmer than the cabin heater. Where possible, avoid short, intermittent trips by combining them into longer trips. Use an engine block heater. To minimize your electricity usage, use a timer or only plug it in when necessary. Two hours is enough time for the block heater to do its job. Park inside a garage when possible. Clark, S. K. and Dodge, R. N. (1979). A Handbook for the Rolling Resistance of Pneumatic Tires. Wong, J. Y. (2001). Theory of Ground Vehicles, 3rd ed. Adam J Lohonyai. Simple theme. Powered by Blogger.